St. Mark Summer Sabbatical – Breathe Deep! Pastor Beth, Pastor Eric, and their children, Grace and Isaiah, would like to thank the people of St. Mark and the Clergy Renewal Project for an amazing sabbatical this summer. St. Mark approved a pastoral sabbatical leave which gave them the gift of time. The Clergy Renewal Project awarded St. Mark a grant which gave us the gift of funds to support our pastors on their adventures as well as our summer congregational events. The guiding question in our planning was: “What makes your heart sing?” Our proposal used as the theme a song written for our congregation by Trudy H. and Terry S. entitled, “Breathe Deep.” This sabbatical was a time for all of us to breathe deep the creative breath of God, to live deep within God’s word, and to love deep because love gives life and makes us whole. As Eric and Beth pondered the question of what makes their hearts sing, it became clear to them that their answer included the beauty of creation and the wonder of creativity—their own creativity and the creativity of others. On May 20th, Pentecost Sunday, we were all blessed and sent out on our shared sabbatical. The next day, Eric and Beth left for a week in Washington DC at the Festival of Homiletics. Some of the country’s best preachers were there. They heard many unique and gifted speakers through out the week. After that, they returned home to take art classes, attend a film festival, do lots of reading, and give ballroom dancing a twirl. While in Orlando, Pastor Beth is very thankful to have had the opportunity to meet with artist, writer, and Pastor Jan Richardson. The Utto-Galarneaus returned home for a week and then traveled to Europe. After flying into London they had 50 days to make their way through England, Scotland, France, Germany, Austria, Italy, and Switzerland. This trip allowed them to explore their roots as Christians, as Lutherans, and as a family. They also experienced stunning scenery, delicious food, fabulous art, beautiful music, amazing cathedrals, and delightful people. 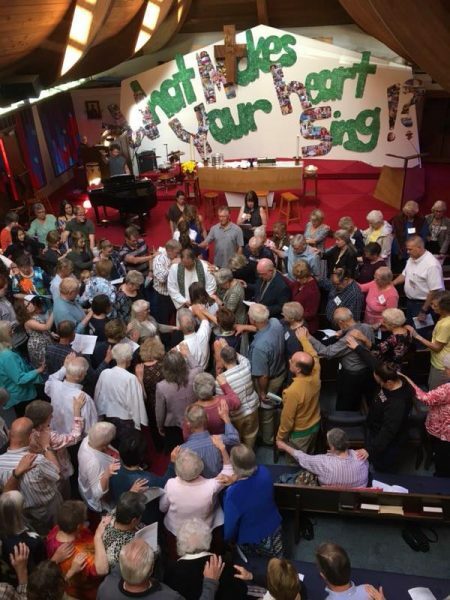 The pastors and their family returned to St. Mark for worship on September 9th. They were welcomed back with a wonderful blessing, a new congregational song, and a spectacular salmon lunch complete with gelato for dessert! This was a “shared” sabbatical. While our pastors were away, the rest of us at St. Mark also contemplated the question of “What makes your heart sing?” With the leadership of retired Pastor David Nelson and the Sabbatical Committee, the people of St. Mark engaged in their own fun and creative activities and explored the God-given gifts of creation and creativity. Pastors Beth and Eric and their family are extremely grateful to the people of St. Mark for the gift of this time to step aside from their pastoral duties to renew, reflect, rest, and recreate. We are absolutely, positively thrilled and thankful to have received the generous grant from the Clergy Renewal Project which enabled our pastors to take a dream trip of a life time and for us at St. Mark to breathe deep the creative breath of God! Thank you for your loving support. Breathe deep the breath of God!